Newly restored Block Paving can make a home welcoming, and be the envy of your neighbours! ​Don't take my word for it-see for yourself-Mr. Brewster says it as he saw it! 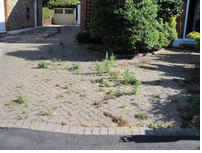 ​"Our Block paving Driveway was in such a mess with moss, weeds and mud we actually considered having it all taken up and replaced with gravel. But when Alastair had finished his work the drive looked brand new just as promised! All in all a thoroughly professional job by someone with the knowledge, the proper equipment and an absolute pride in his work. There is only one way to restore a driveway that will last, and that's the Alastair Elgey way!" Mrs. Walker felt her block paved driveway was in dire need of restoration, and so after much research rang us to undertake this. As you will see from the before and after photos and the video testimonial Mrs. Walker was delighted with the results So what are you waiting for give me a call on 01377 272044 today and get your free quote! Don't let weeds, moss and dirty block paving be the welcome your guests and visitors see on approaching your home. Transform your driveway by letting us pressure wash it using brand new technology, re-sand, and if required seal your driveway. Newly restored block paving - brought back to new, giving it that wow look once again, making you proud of your investment! Block paved pathway - before weed treatment, and pressure washing. A far cry from the appearance enhancing investment it once was. Pathway now treated for weeds, pressure washed, re-sanded and sealed - What a make over and a joy to behold! Sealer at work on Block Paving Surface! A popular choice of paving for driveways and patios in many homes but because of its composition and the way that it's laid, it can be hard to keep clean. The sand filled gaps between the blocks make it easy for weeds to take root and grow, and in shaded areas and damp conditions algae, moss and lichen will flourish. We provide an excellent block paving cleaning service across East Yorkshire. Our service includes using fungicidal cleaners to eliminate the surface growth that has built up over time, and removal of the muck in the joints, which is a significant factor in promoting weed growth. Once properly cleaned and dry, we recommend that two coats of highest quality professional block paving sealer are applied. This acrylic coating creates a non porous resin barrier. It will make the surface water resistant and protect the paving from damage and colour loss, caused by UV light. The seal will inhibit weed growth, although without regular maintenance weeds will eventually creep back. Our popular Maintenance Plan ... from just £12 per month, we can keep your driveway practically weed/moss free all year round using new and improved technology and methods. Application of highest quality professional block paving sealer if required!